There’s a street food that everyone’s obsessed with in Taiwan, and it involves boneless nibs of chicken marinated in five-spice, battered and crispy-fried, dusted with white pepper, and tossed with fried basil leaves. How can you improve upon this irresistible snack? You can’t, really. But you can take the same formula and make other foods irresistibly tasty, too. And one ingredient that works very well with it is juicy chunks of king oyster (or trumpet) mushrooms. At least, that’s what I’ve discovered through making them as part of a five-course pop-up menu for the launch of The Food of Taiwan recently at the San Francisco restaurant, Namu Gaji. Before we get into why these unique fungi are so fun to fry, a brief background on the original dish’s context. Called Yan Su Ji in Taiwan, this fried chicken snack is often translated to English as “popcorn chicken” (although in The Food of Taiwan I called it “Fried Chicken Bites” to avoid any confusion with a certain fast food chain’s branded snack). I think its signature flourish—copious white pepper dusting aside—is the basil leaves that are deep-fried and served alongside the bites, crushed up in its paper bag. Yes, another signature is that it’s often served on the streets of Taiwan in a paper bag. It’s a familiar kind of fried food in any case, and an apt one for streetside snacking, since the bite-size, boneless pieces are easier than wrestling with, say, chicken wings, when you’re walking. Fried foods are also a darling of casual snacking at bars in the Western world. Whether it’s Spanish croquetas or French fries, it’s quick and easy to fry heaps of crispy, golden, addictive snacks. That’s why I gravitated toward the theme of pub foods when I decided to throw some family-style dinners to celebrate the publication of the cookbook. In my hometown of NYC, I wanted to hold a dinner at Jimmy’s No. 43, a basement craft beer bar that’s become a community hub for various local food groups. And in San Francisco, my choice venue was my old college buddy David Lee’s family business, which just happens to be one of the best and most innovative Asian restaurants in town. These two venues perhaps couldn’t be more different in terms of the cuisines that they usually serve. 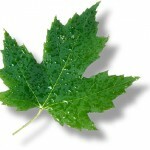 But they have a lot in common in terms of atmosphere and community. At both, there are long, communal tables that foster conversation and sharing amongst diners. 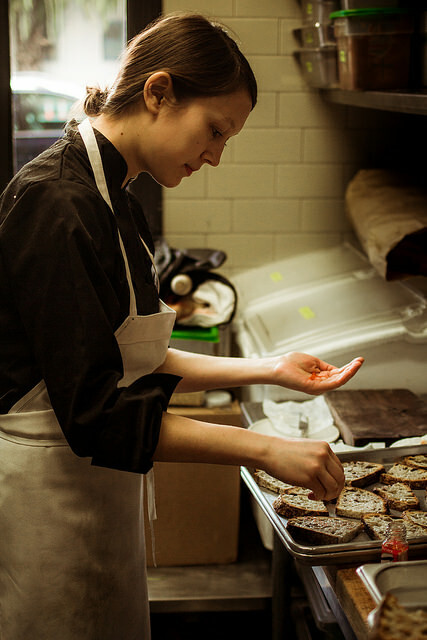 Both pride themselves on sourcing ingredients from their favorite makers (and friends) in their own local food systems. Not coincidentally, both totally welcomed the idea of me “popping up” and taking over their kitchen for a one-night-only dinner focussed on the food of Taiwan. I’d planned for these dinners to take place about one week apart: the first, at Jimmy’s on March 29, before heading to the West coast, schlepping my knives, gathering ‘round my friends and kitchen volunteers, and even my cargo of lacto-fermented mustard greens in mason jars for the event. But nobody could have predicted that a gas explosion in a building two doors away from Jimmy’s No. 43 in the East Village would have taken place, shuttering much of the block for more than a week and taking away lives—as well as that first dinner event. So I arrived in San Francisco last weekend with a fresh menu that had never been served before, and a really grateful perspective on things overall. So on we plowed with the dinner at Namu, and in spite of all the sadness, and the uncertainty about whether or not Jimmy’s would open in the days before, we made the meal happen. And with a theme like “Taiwanese food reinvented as pub foods,” I mean, it really happened in the coziest, friendliest way possible. I made new friends and reconnected with old ones over the course of the event, and I hope that many people dining at the table did as well. Despite all the worry and troubles and travel, I really had a swell time (and I’m struggling not to say “blast” right now as that would be a most unfortunate word choice). 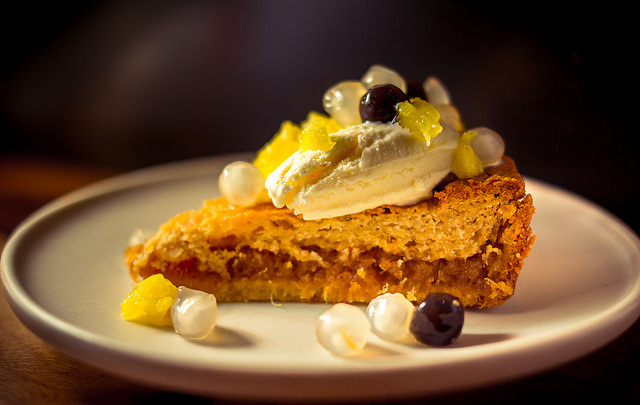 For the final course, the dessert, we served the famed Taiwanese pastry Fung Li Su (or pineapple cake) a la mode, baked in tart pans rather than their standard individual cubes, as shot here by my friend, photographer (and now dishwashing pro) Pete Lee. And of course, we served these “Fried Mushroom Bites”, prepared in the manner of Yan Su Ji, as a communal course at one point of the night. They were my favorite, surprisingly simple course of a dinner which included Gua Bao served in brioche slider buns that were homemade by Namu’s Executive Chef Dennis Lee. And yes, these mushrooms were irresistibly snacky—every bite as much as fried chicken, only more interesting due to the toothsome, juicy texture of the mushrooms that were used instead. I really have to say (and I seldom do in recipes), don’t substitute for another variety of mushrooms with this dish. 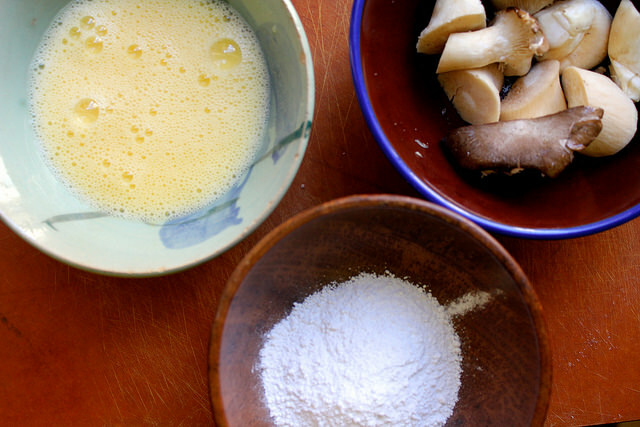 Get king oyster or trumpet mushrooms in order to achieve that bliss while you’re going through the effort of deep-frying them in batter anyway. Some of us in the kitchen remarked that the interiors of the fried and battered bites resembled lightly cooked scallops, with its moist texture and ever so gently funky flavor. Although I’m sure that scallops themselves wouldn’t suffer from overcooking if you were to fry them this way (don’t do it). In case you’re wondering—and I hope you are—a little bird told me that Jimmy’s No. 43 is finally going to open tonight, after two weeks of being in the absolute wrong place at the wrong time. After two weeks of city cleaning and forensics inspecting, of bartenders out of work and bills still to be paying, it’s going to reopen very soon. So come on down to the pub and raise your beersteins to this one for recovery. 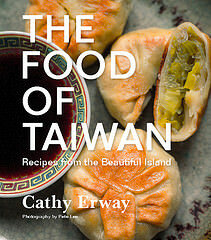 After getting some good practice, we’ll have to reschedule the Taiwanese pub food dinner at Jimmy’s another time soon. Mix the beaten eggs with the 1 cup of water and place in a bowl. Set beside another bowl with the starch. Dip the mushroom pieces in the egg wash and dredge them in the starch, shaking off the excess. Working in batches, fry the mushrooms in the hot oil for about 2 to 3 minutes each, turning occasionally with tongs, until the surfaces are slightly golden. Remove immediately from oil and set on paper towels to drain. Continue with the rest of the pieces. Fry the basil leaves for about 30 seconds or until just crisp, and remove to drain on paper towels. Dust the fried mushroom pieces generously with the white pepper and 1/4 teaspoon salt. 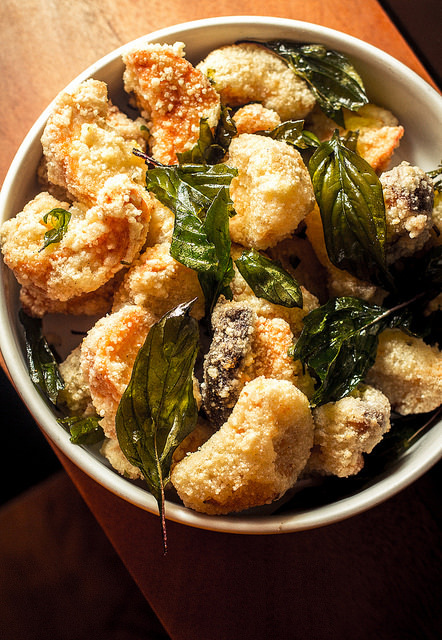 Serve with the fried basil leaves. Seven brownie points: Deep-frying is not the most healthful way to prepare anything (nor the least complicated). But when that fried, snacky something is usually rich meats besides, it’s a refreshing change to replace it with fresh vegetables instead. You’ll still be satisfied with the crackly, golden-fried crust, and you might even find a new appreciation for vegetables you once overlooked. I’m excited to prepare trumpet mushrooms in a myriad of ways now after this experiment. Six maple leaves: King oyster mushrooms are a unique fresh produce that I seem to only find either from small, specialty producers at the farmers market, or at an Asian supermarket (where I once found them labelled in English as “Fresh Prince Mushrooms” and had a guffaw). 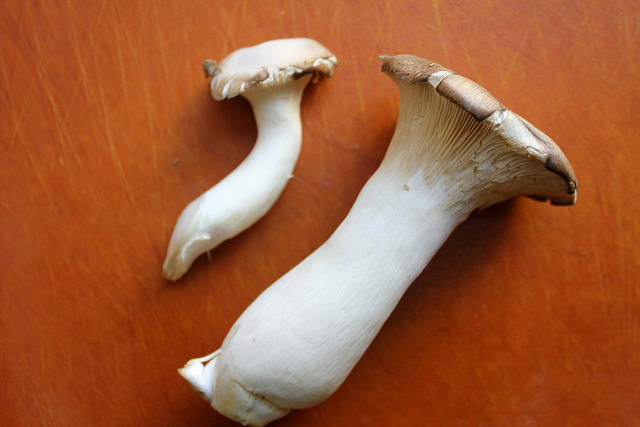 But small or large outfit, organic or not, mushrooms are a year-round ingredient grown fresh. They’re pricey, but well worth seeking out if you can find it. This recipe also relies on some pantry staples that you might have to seek out from afar, like the sweet potato starch and five-spice. Yum. It’s difficult to find a good batter recipe and this one looks nice and crunchy so i’ll give it a try the next time i tempura something for lunch! You have to go with this Homepage and change your windows 10 OS mobile setting for wireless Bluetooth connection and i am enjoying http://windowstuts.net/mobile learning free and Online.